As a local history librarian, I have worked very closely with the Death Records, 1897-1920 collection available online at Seeking Michigan. Totaling nearly 1 million certificates, this collection covers a critical period in Michigan’s history, the point where the state became the worldwide epicenter of the automotive industry. Drawn by the lure of steady work and wages, thousands of families migrated to Michigan from all over the United States and around the world. As a family history researcher, I am particularly fascinated with off-the-beaten path records, those unintended, peculiar, or otherwise accidental certificates. One terrific example at Seeking Michigan is Edith Constance Fraser, who died in Windsor, Ontario on 24 January 1900. Born in Canada in 1867, Ms. Fraser was the daughter of Alexander and Mary Fraser, and was buried at Elmwood Cemetery in Detroit on 26 January 1900. Now let’s explore the corresponding “official” Ontario death record for Edith Fraser. This record not only reinforces some of the data gleaned from the Michigan certificate, but also offers new information, including Ms. Fraser’s residence in Essex County and her religious affiliation. 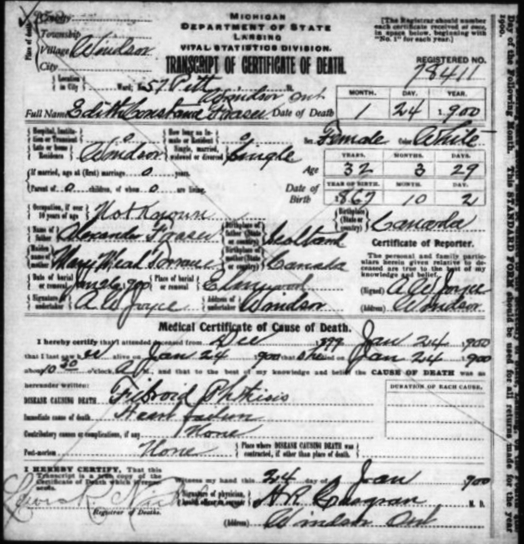 All good material, but more important is what is NOT shown – parents’ names, cemetery, name and address of undertaker, and date of burial – information all provided on the Michigan record. When comparing the Michigan and Ontario records side by side, although each provides unique information, one can argue that the Michigan record offers far more genealogical value than the Ontario one. The point here, then, is that in some cases, there may be a second – and possibly quite different – record; this would be true particularly with families near a county, state, or international boundary, or ancestors that are buried in a different location than where they lived. The invalid or “X” record may provide important fields of data, such as parents’ names, that the official certificate does not. Depending on the state and time period, then, perhaps the accidental record is superior to the official one, much like the Edith Fraser example above. Other out-of-state examples abound in Seeking Michigan, including death certificates from as far as Oakland, California, St. Louis, Missouri, and Cleveland, Ohio. In the case of Edith Fraser, a genealogy researcher would be delighted with her paper-trail legacy of dying twice. Each record provides unique insight into her life and family, while simultaneously opening new avenues of research. What more could one ask for?